Bad Breath, also known as halitosis, can result in awkward and embarrassing situations. However, it’s easy to fight bad breath with a few simple changes in your everyday life. One of the best ways to fight bad breath is through good basic oral habits. The food particles remaining in our mouths after eating basically rot in our mouths when not brushed or flossed away. Bacteria also uses these particles to form plaque, the sticky, yellow coating that gathers on the surfaces and in between teeth. This process leads to bad breath. Brushing and flossing regularly, along with regular dental visits, can keep your mouth clean and smelling fresh. Brushing and flossing after every meal is ideal, but not necessarily realistic. Although it shouldn’t be used solely to replace brushing and flossing, rinsing with mouthwash after a meal can help clean out food particles and cut down on harmful bacteria. If there’s no mouthwash available, rinse out your mouth thoroughly with water. Eating well helps keep our smiles healthy and strong. A diet rich in Vitamin C helps prevent gum disease and gingivitis. Foods like berries, melons and citrus fruits instead of supplements are best. Also, crunchy foods like apples, carrots and celery clean teeth naturally. Avoid sugary foods that stick to your teeth, as well as onions and garlic – these continue to cause bad breath while they’re digesting. Herbs are easy to grow and maintain, and a wide variety help fight bad breath. Choose from spearmint, eucalyptus, cardamom, rosemary, tarragon, and coriander, and chew on them after meals or throughout the day. If you prefer, soak the herbs in hot water as a tea! Although brushing and flossing are ideal, there are simple steps to help keep breath fresh during the day. Drink plenty of water, rinsing your mouth out after meals. Although they tend to mask bad breath instead of helping to eradicate it, gum and mints are helpful in a pinch, as long as they’re sugarless. 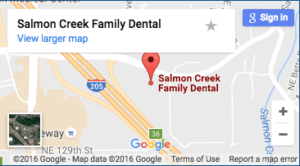 Fighting bad breath can be done easily using these simple strategies from your family dentist in Salmon Creek WA.